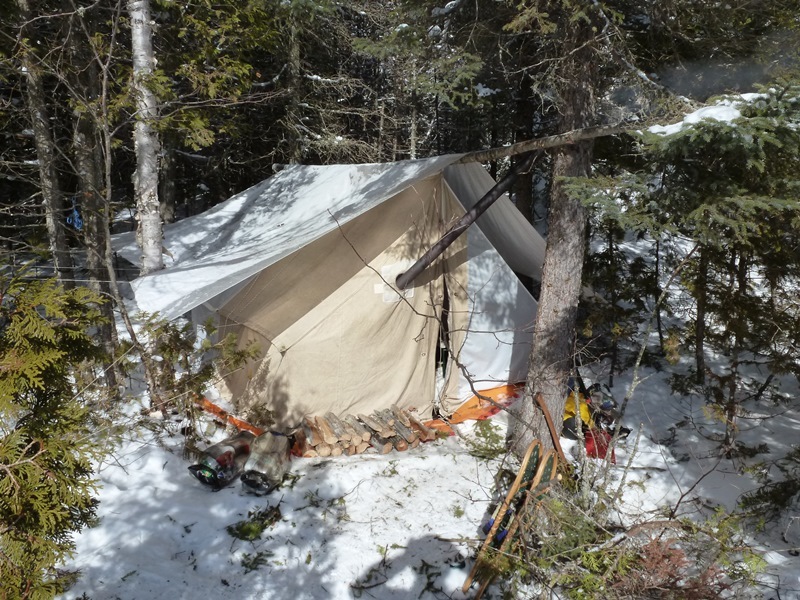 Steve, yes, the wall tent we use is more work to set up, but we make it easier by squeezing it into a grove of trees where we can bridge a gap using one pole. A "one-pole set". We cut that from the bush, but you can often spot 2 young trees that are growing too close together, and only one is going to make it anyway, so we use it. After a couple of trips of experience, 2 guys can set this up fairly quickly, depending on how much clearing they have to do to the site. 3 is even better. But it does take time and it is work. Typically from the first walk-into the site, the survey, until tea is made and the team is invited inside, it's about 90 minutes. A bit more if you have to walk far for firewood. But work, in the bush, is not a bad thing. It gives pride in accomplishment. And creates a good place to be, within and without. 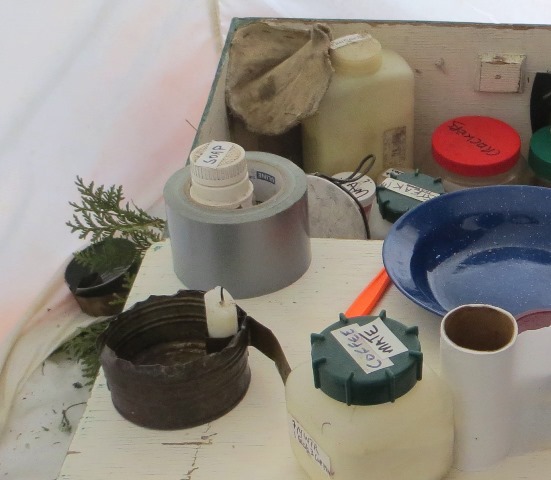 Water is always in demand in camp. 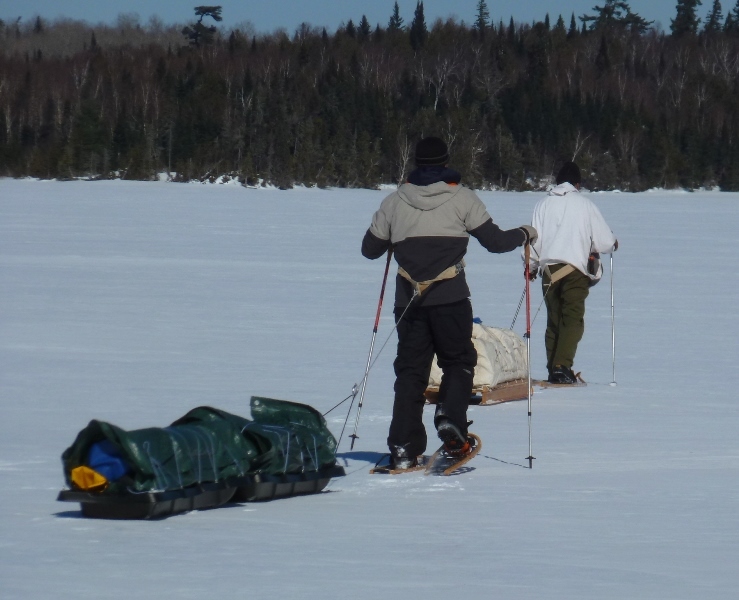 We usually don't put a hole in the ice except for fishing. 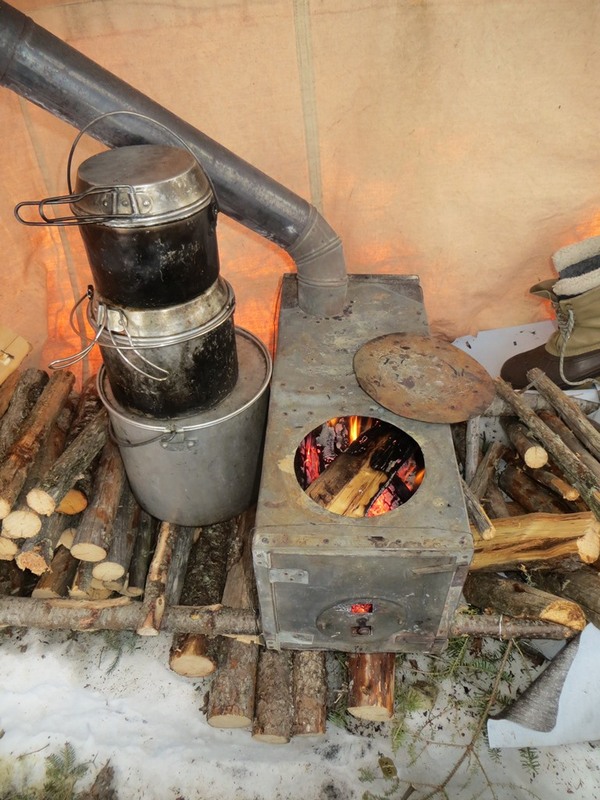 The stove is always producing a surplus of heat, so we use snow. This aluminum pail sits beside the stove on a stick with flats axed under each end -- stops it rolling. We use only 1 stick because that way the pail is always leaning against the stove -- gets more heat. The pail can be put onto the stove, but the fastest way to transfer heat is to use the middle-sized pot, lowered into the hole into the firebox, and use a mug to decant water back and forth to the pail. Handy when you want a bath! Were any fish caught and eaten on this trip? Thanks, B. We had 2 days set aside for fishing. On the first we had light freezing drizzle for a couple of hours -- I stayed in the tent. 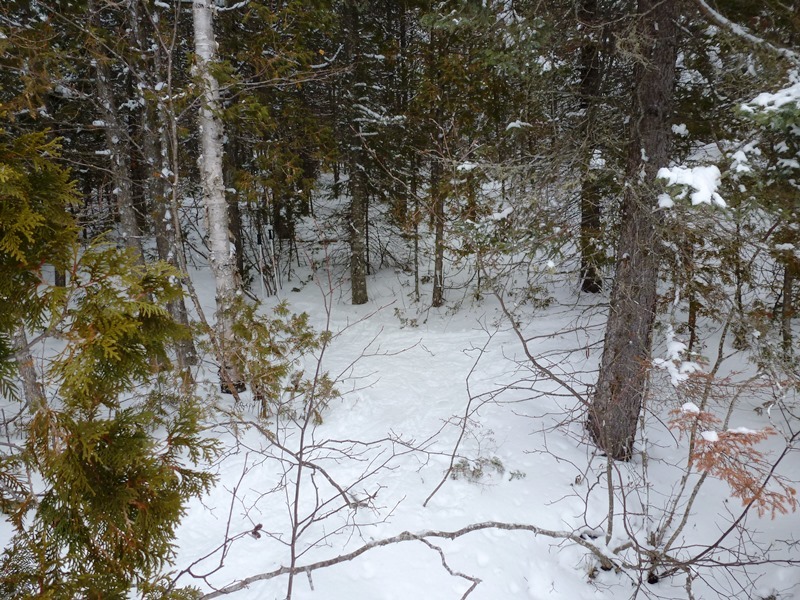 And the next day we had -20C and a 25 kt NE wind -- howling, so I elected to make a trail in the bush. We suffered sausages and chops and dried beef. When we go camping, the fish seldom panic. 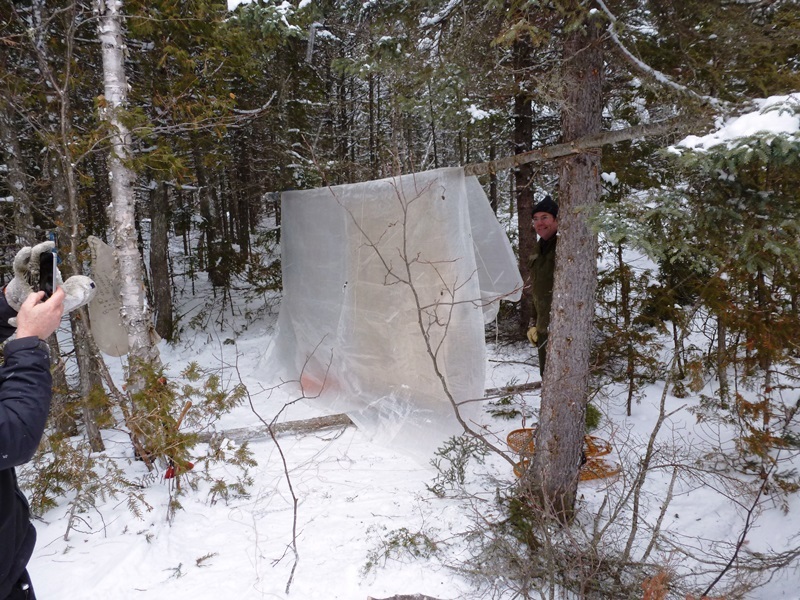 Here's a sequence of identifying a site in raw bush for a wall tent, setting-up, then the impact after. Bush Etiquette: if you find a site with poles cut, it is perfectly permissible to use them for yourself. But it is an execrable crime to burn them, no matter how tempting. It's best if you can have a Gear Day with your trip partners a week before departure. Breakdowns like this can be spotted. But there's always a solution! Also, there are always duplications and extras that accomplish nothing but adding weight to the sleds. These never get sorted out if you only meet at the train station. 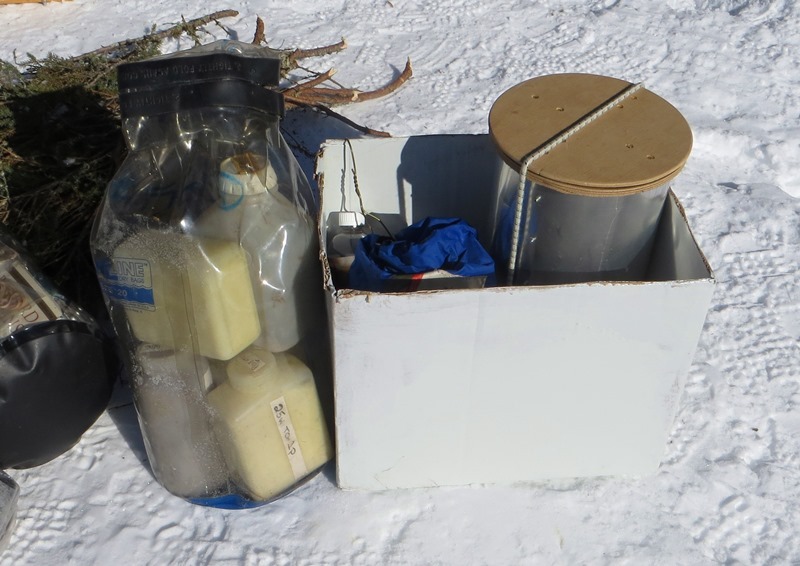 Great set-up for the grub box and all the essentials... thanks for sharing what it's constructed of and the basic supplies you keep within... 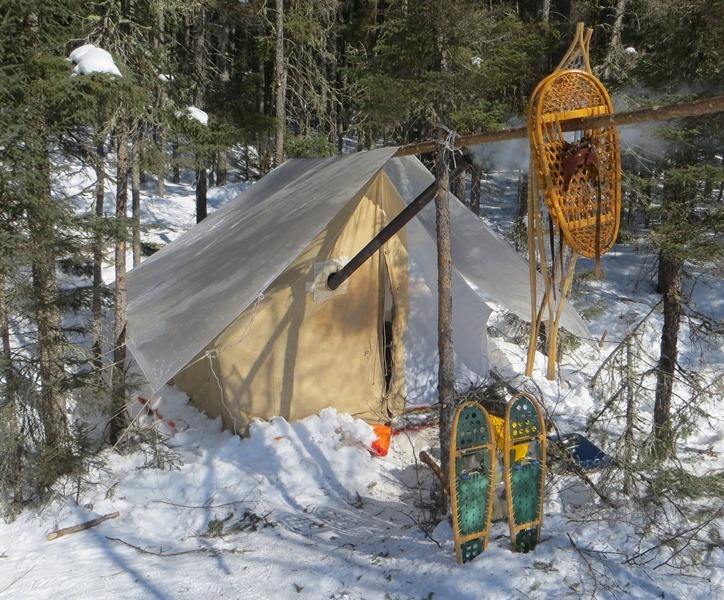 Always enjoy your winter wander trip reports... you always have excellent photos and details and you're always willing to share you hard earned knowledge of bush craft in the winter. Thanks Al. It's good to have a record, and these days you might as well do it in the "cloud". 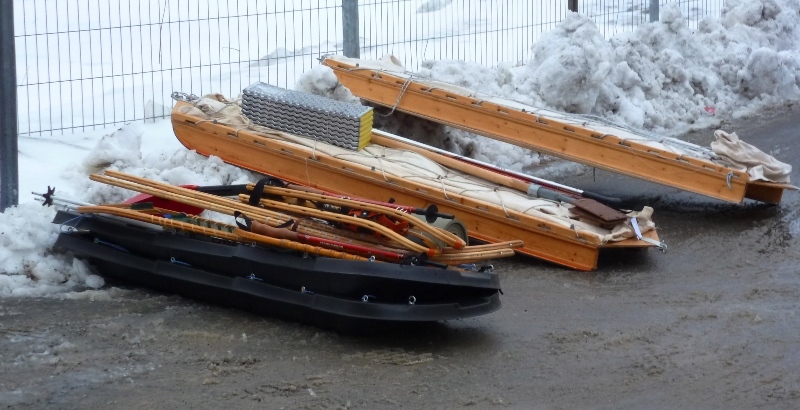 We took 2 types of sleds on this trip as you probably saw, the ski-sleds, and a modified pair of Pelican kid's-toboggans. I used to use a sheet of UHMW plastic in the form of a traditional toboggan, with wood stringers to give it shape. It is now my least-favourite design. The ski-sleds tow easier because they are always riding up on the snow at least somewhat, because you are towing while wearing snowshoes or skis. The traditional toboggan gains weight during the day. 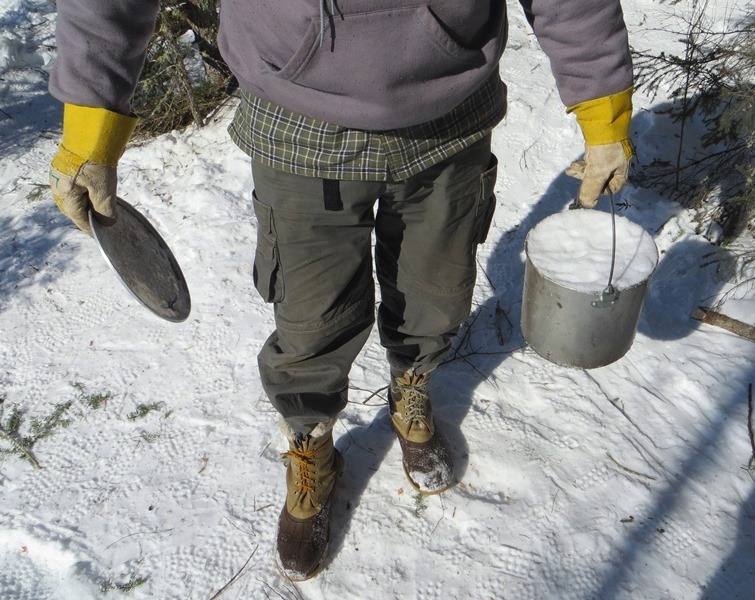 Snow wedges itself into every crack and crevice, every corner of the load between your packs. Heavier and heavier. And when you're pulling a toboggan, all that really matters is weight. 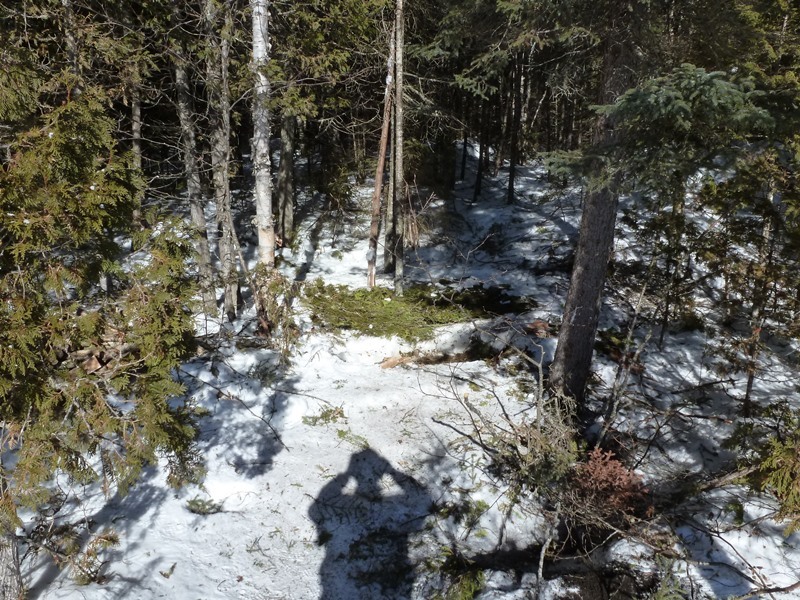 They also have more surface area on the snow than is generally required, and are not so great on non-level surfaces -- they slide sideways, and it's difficult to put runners under them that don't break off. 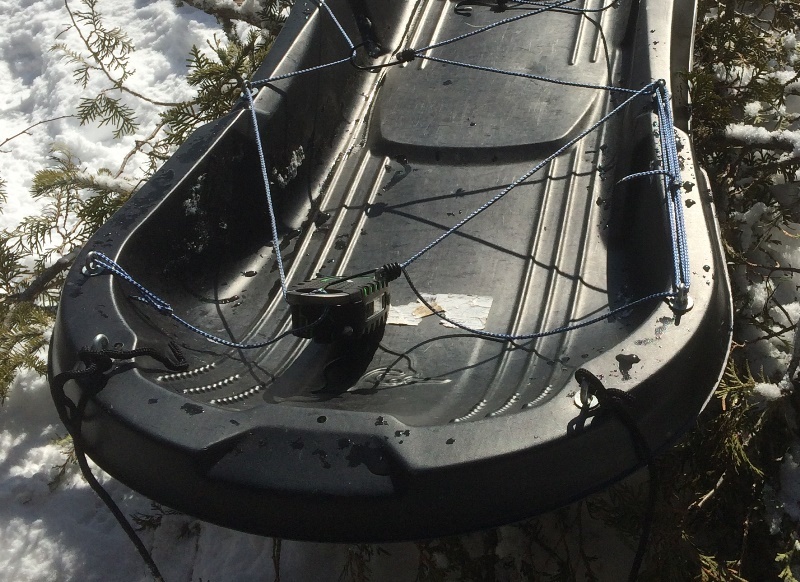 If I was building a ski-sled again I'd be a fanatic about weight. I'd use cedar rails, and lighter fabric, lightening holes, and the lightest strong plywood I could find -- maybe scarf together a length of poplar ply. I'd also make them longer by extending the length of the skis, either by shingling another section of cut-off ski, or by using UHMW plastic. 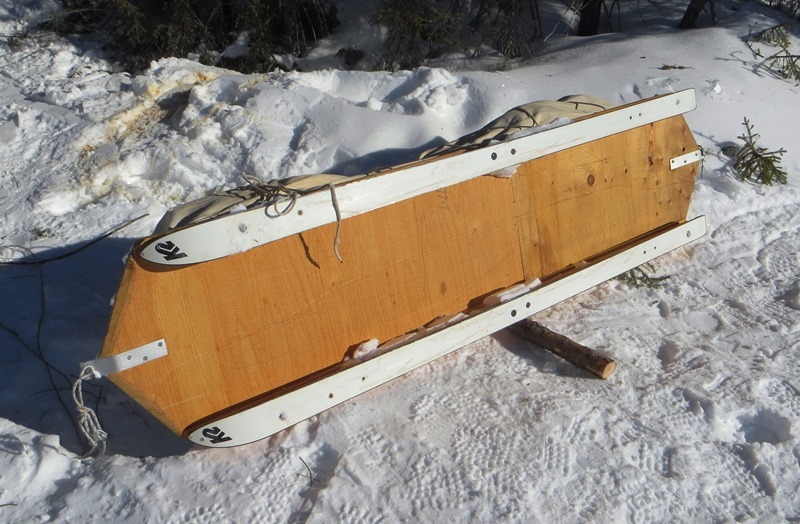 With a sled/toboggan, long and skinny is much better than short and wide. Also, a long one means you don't have to double-stack your load, which means it tips over less. 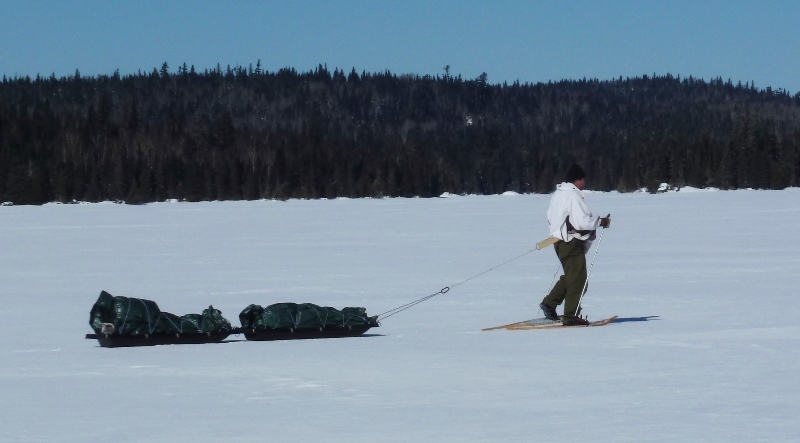 I modified the Pelican sleds a few years ago as an experiment. I was trying to concoct a sled that someone without a table-saw could come up with simply and cheaply. Obviously the Pelican sled was too short, but I thought, "Why not use 2? -- they're only $19 each, and this way you can easily divide your load when you have to climb a steep hill in the bush." They require modification. The tow-holes are not strong enough, and you need a containment system. So I bought eye-bolts, large washers, and also cut pieces of 1" x 1/8" aluminum -- easy to cut and drill. The plastic is not very thick. Some care must be used to avoid breaking them up over logs and rocks. But I've used them for a few trips now and they've worked well. Again a wealth of experience coming through in your reply... 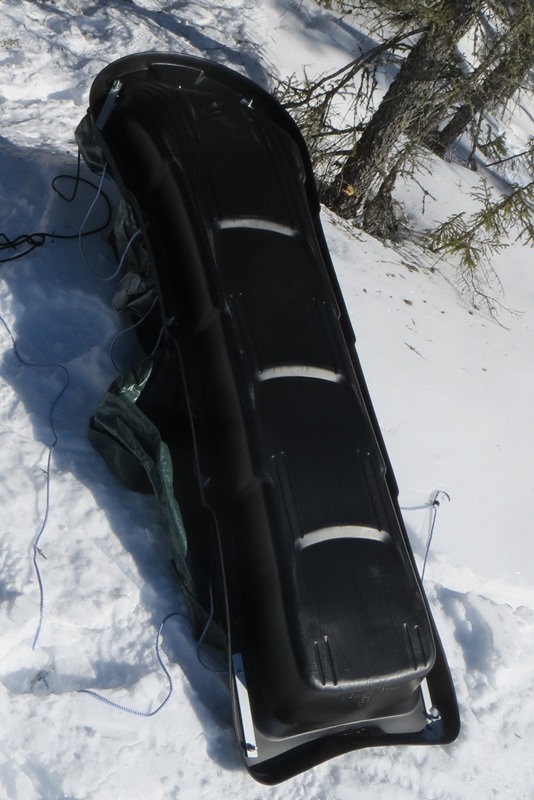 I know that the biggest problem with the HDPE toboggan was tipping on slopes and uneven surfaces and controlling the speed down hills... I have used a similarly rigged Pelican (CDN Tire model) toboggan with PVC pipes for pulling and found it worked well if it was one level load... as soon as you added any height it was tippy as all get out..
Too bad they don't make them 3 feet longer... also Cdn Tire always had them, but now it's hit and miss..
Have a great year and a summer full of great canoe trips.. I didn't have any trouble pulling the 2 of them, each lightly loaded. We each tow our own stuff plus the share of the camp gear. That way there is personal incentive to "simplify and add lightness". 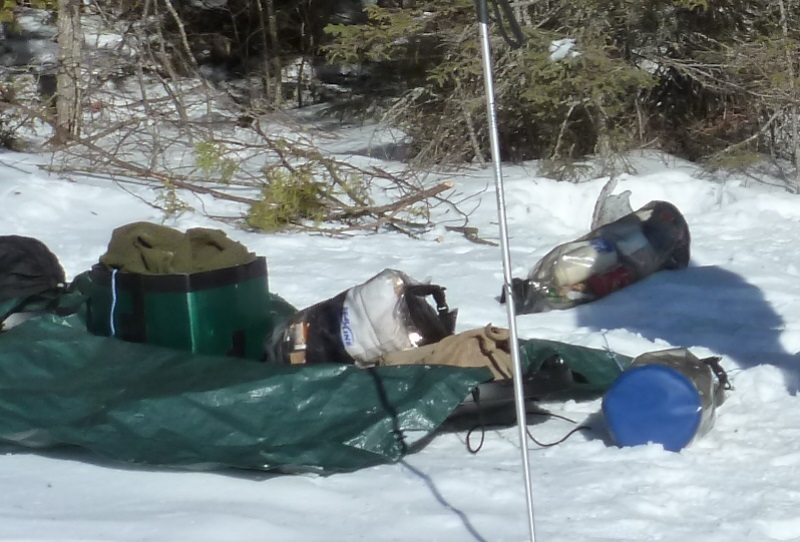 I am fairly ruthless -- I don't bring as many clothes as I do on a Fall canoe trip, because there is no risk of getting dumped -- because I always end up at some point leaning into my towing harness wishing I'd brought even less. At one point I swapped loads with Sion, to compare. They were close to the same, but the pelicans were a little easier. 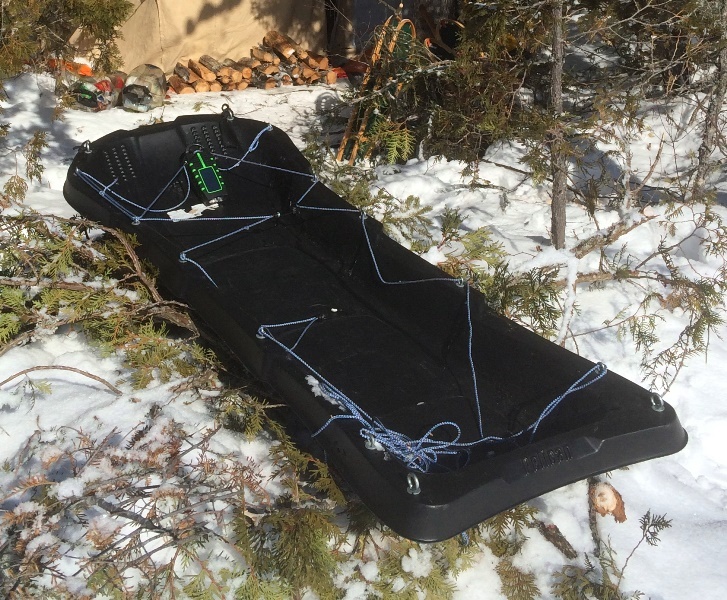 There was more weight on the ski-sled, so that might have been it. Pulling resistance was about the same except that when the towline came tight there was more of a jerk in your harness. It would have been better to use 1/8" nylon as a towline -- nylon stretches like bungee cord. The poles are worth bringing. Your arms really do ease your legs over the course of a day. The poles help your balance. And the poles give you constant feedback about the condition of the ice, or slush, or where the old trail lies when its hidden under 2 inches of fresh snow -- undetectable by your eyes. 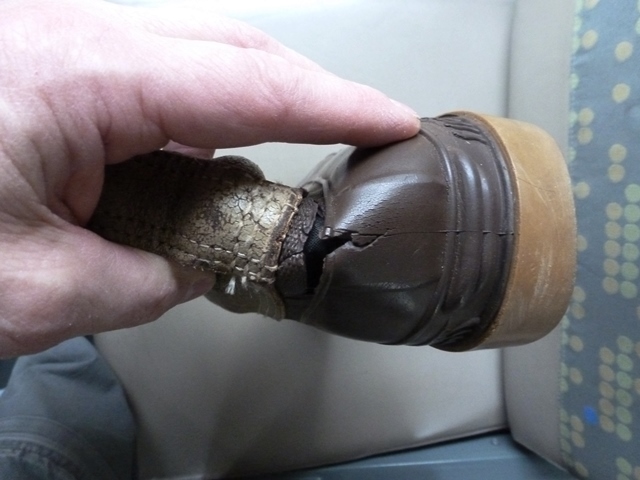 Check your pole baskets and straps before departure. They fail fairly often. Good ideas, Al. If I was travelling in a more vertical environment I would want a set of shafts, to stop being over-run. I found the aluminum flats very easy to work with for backing-up the bolts. Your other point: that's another reason why I went with 2 of them -- so I could single-stack. I think it's easier to pull 2 sleds that are lightly-loaded, than 1 heavy one. And thanks for the canoe-trip wishes -- I retire Aug 01 this year, so hope to have more time for canoeing! The sleds need to have a containment system. This keeps your gear together, negates the requirement for packs, and prevents snow from accumulating on your load during the day. It should be simple, strong, lightweight, and allow access to your load at a rest stop. On the ski-sleds I sewed canvas. It was very tough, but needlessly heavy. I'd use nylon now. For the Pelicans I chose a simple 6 x 8' tarp. The tarp also serves as an emergency shelter. Very simple fold-over. 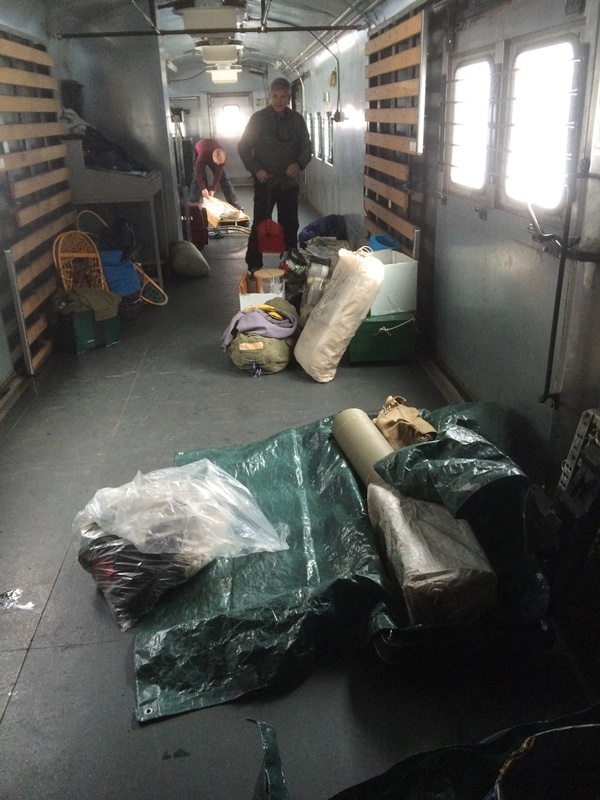 Here we are in the train getting organized for the drop-off. To hold it in place I use a web of crossover straps. I DON'T USE, OR LIKE, BUNGEE CORDS! (Bushmen know a few knots.) This system works quite well. The line in the right of the photo holds the hooks (store-bought). It is fixed in length and never is adjusted. 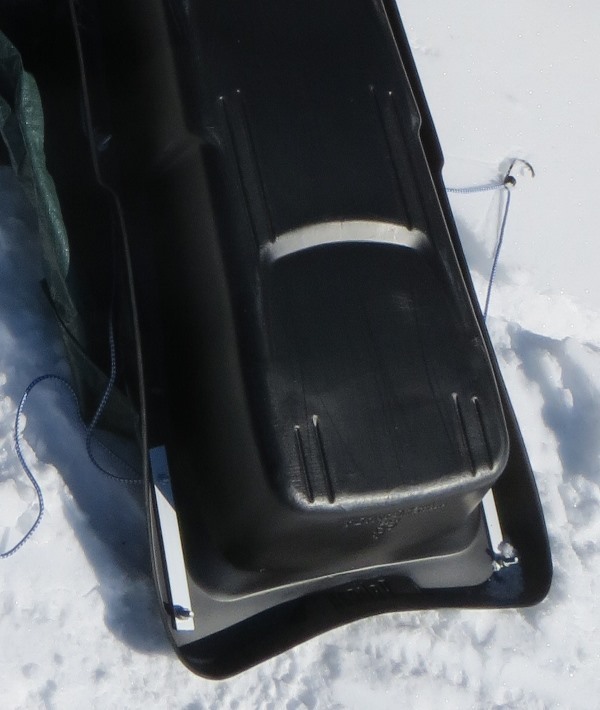 There is a hook about every 16" of the sled. The line on the left is secured at one end, then goes up over the load and engages all the hooks, and is tied-off at the other end. In use on the trail you can untie that end, free-up some slack, and access your load very quickly if required. On the ski-sleds I used the same system, but made my own hooks from sections of copper brake tubing, pounded flat and bent around. 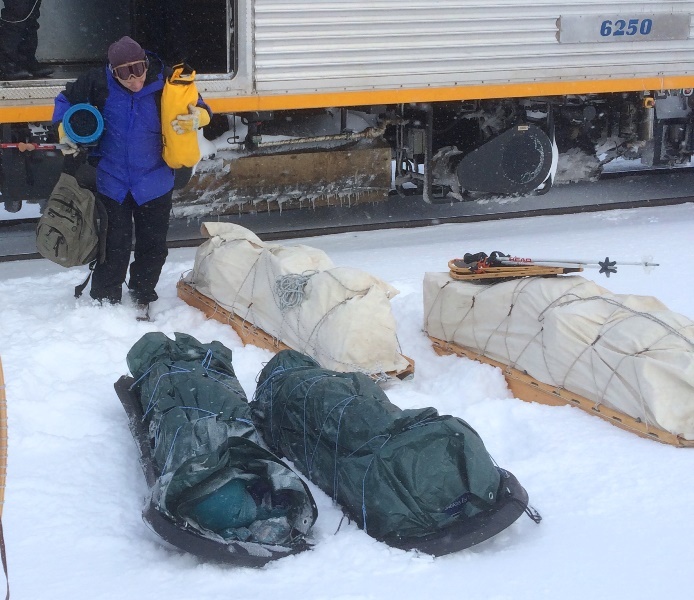 As you can see from the train picture above, I use only the simplest, lightest gear-containers. Clear plastic garbage bags work surprisingly well. And the stove is in a grain-sack. For my personal gear I use a clear dry-bag (clear so you can see where the darn spare batteries have got to...). Same for the extra food. But for other camp items the best thing I've come upon is a cardboard box. This is WAY BETTER than plastic tubs from walmart. The tubs are the wrong shape and size. They are designed to stack, and flare outwards as they rise. I take a stout cardboard box the right size to fit flat on the sled. Then I paint it with old oil-based paint to give it some water-resistance. And I don't bother with the lids -- the containment takes care of that. They last longer than you think. Some of my boxes have been in use for ages -- probably 10 years. Obviously if there is rain I take care to keep them under the containment. A run of duct tape around the rim helps preserve them.